Each morning, Patty and Tom Erd mix a paste of turmeric and drink the wood-tasting mixture to calm their screeching joints. Their aches and pains come from years of grinding spices, but the culprit is also the cure. “It works better than ibuprofen to decrease the swelling,” Patty Erd told me by phone recently. I called Erd to ask her about a data set I found buried on the Economic Research Service of the U.S. Department of Agriculture’s website. Compiled from private and government sources, including industry surveys, it details the availability of various spices every year from 1966 to 2012, data that can serve as a proxy for consumption, according to Jeanine Bentley, the USDA analyst who put the data set together.1 While it doesn’t tell us the exact amounts ingested in a year, it does provide some clues about trends over time. Erd and her husband own The Spice House, which was founded by her father in Milwaukee in 1957 and is among the largest and oldest spice traders in the country. I hoped she could help make sense of those trends. According to the data, per capita spice consumption nearly tripled over the past half-century, from 1.2 pounds per year in 1966 to 3.4 in 2012. A look at the individual spices, however, shows different stories, with the use of some of the most well-known flavor contributors varying dramatically over the years. The per capita availability of turmeric went up and down from 1966 until 2004, when it began to increase. From that point to 2011, it jumped nearly 70 percent. Before I had a chance to mention the spike to Erd, she told me about her morning ritual and how popular the spice had become at her store. “Sometimes you have to give the credit to the medical people,” she said. Indeed, the evidence of turmeric’s health benefits is mounting. It has long been used in traditional medicine to treat everything from stomachaches to joint pain, and multiple studies in recent years seem to have verified a wide range of health benefits from the earthy orange powder. One found that it helped prevent diabetes, and another found it to be as effective as ibuprofen in treating osteoarthritis (perhaps supporting Erd’s anecdotal evidence). Most recently, it has shown potential for slowing the damage from neurological diseases. Those studies have made headlines, and it appears those headlines are translating into consumption. But, of course, spicy headlines shouldn’t all be believed. Look at the spice that most of us know as cinnamon, part of an unconventional treatment that was recently touted by potential presidential hopeful Mike Huckabee for its ability to reverse Type 2 diabetes. First, the cinnamon in those cinnamon rolls probably isn’t cinnamon; it’s cassia. True cinnamon, from Sri Lanka, is rarely found in the United States; what’s sold in grocery stores is almost always the bark of a plant in the same family. Second, the evidence on cinnamon’s ability to control blood sugar is insufficient at best. Studies conducted (mostly using cinnamon, not cassia) have shown only short-term reductions in blood glucose, or none at all. 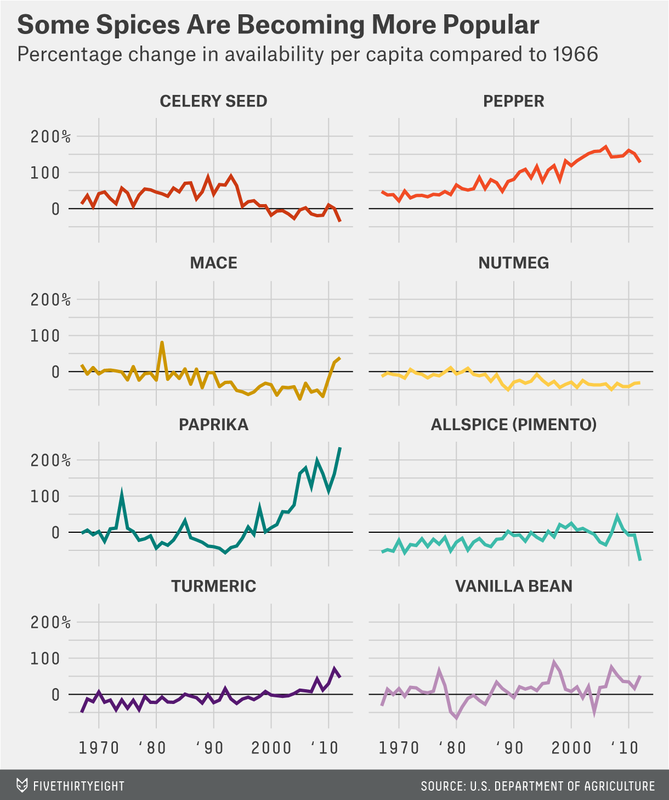 Health benefits aren’t the only driver of spice consumption. The vast majority is used for tantalizing taste buds, and as a nation, our appetite for spice has grown with our waistlines. Pepper and paprika have seen huge increases.2 Celery seed imports, on the other hand, grew through the late 1990s before starting on a steep descent (probably a welcome change for the many supertasters who find celery horribly bitter). Nutmeg peaked in the 1980s and has since declined, while mace, made from the fruit of the same plant, has seen an increase in imports in recent years after declines in the 1980s and ’90s. Ginger availability has shot up nearly 525 percent since 1990. Then there’s the spiciest of spices: chile peppers. On the phone with Erd, I pointed out the 2,000 to 3,000 percent increases in production from New Mexico in the 1980s and ’90s, as well as the overall increases in availability over the past half-century. She told me that chile peppers got big in the 1970s, which is reflected in the domestic production data (though imports didn’t increase until the mid-1980s). When she and her husband opened The Spice House’s second shop — in 1992 in Evanston, Illinois — it seemed like everyone who entered had to have ancho, New Mexican and guajillo chile peppers. The Erds couldn’t figure out the obsession until one day a customer walked in with a Rick Bayless cookbook.3 While the data doesn’t tell us where each chile is imported from, Erd said that what’s in vogue changes every few years. Most recently, that has included the Espelette from France, Aleppo peppers from Syria, and the merkén, a copper-colored, smoky chile from … Chile. Laughing, Erd told me about the time that Julia Child visited her shop and declared: “I just can’t wait for that trend to go away!” Sorry to disappoint Julia, but there are no signs that chile is going out of style just yet. The available quantity of a spice doesn’t necessarily match what people want to consume. 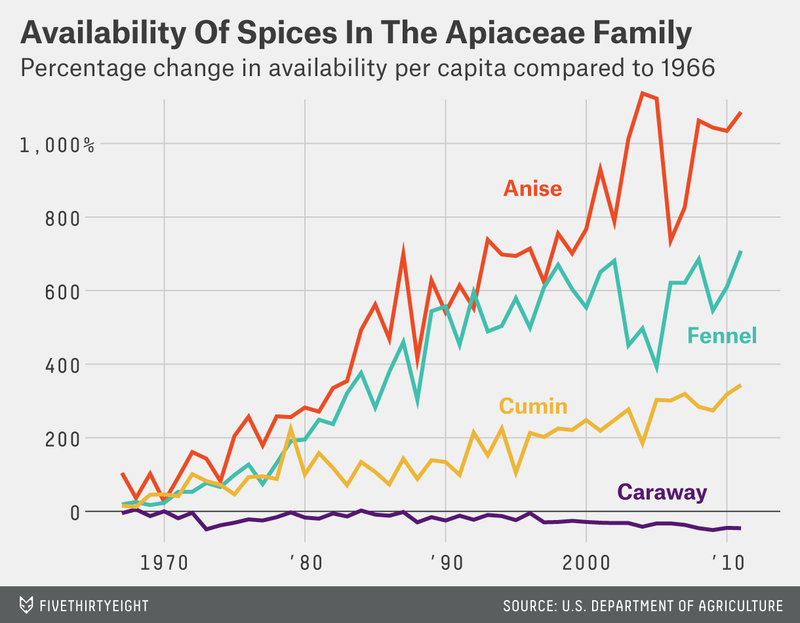 Erd directed me to allspice (also known as pimento), which had a lower per capita availability in 2012 than any year since 1966. She told me that the best allspice comes from Jamaica but that the island nation barely grows enough even for domestic consumption, let alone export. Meanwhile, it’s a current favorite among her food-driven clientele. Similarly, the best vanilla comes from Madagascar, but cyclones in 2000 destroyed crops, causing availability to decline and prices to soar for several years afterward. Although the data shows a decline in availability in the 2000s, it was a question of supply, not demand. In fact, the continued consumption despite high market prices might be a sign of how popular vanilla was during that time. Then there’s the family of flavors that no one ever calls plain. Anise, fennel, caraway and cumin all come from the same plant family and are similar in look. Although they are all often described as tasting of licorice, the flavors are quite distinct (a quick Internet search found dozens of forums about the similarities and differences among them). Over the past 50 years, anise, fennel and cumin have seen 1,000, 700 and 375 percent increases in per capita availability, respectively. Meanwhile, cousin caraway has had a 50 percent decrease. Erd and I wondered if rye bread and sauerkraut were falling from grace. Despite the differences among the spices, the USDA had to start combining data on fennel, anise and caraway seed availability in 2012 as a result of changes in industry reporting. It may be impossible to know just how unpopular caraway is in the future or whether it makes a comeback. For all but two spices, the data in the set is imports minus exports. Domestic production of most spices is minimal, so the data set only includes data for two: mustard and chile peppers. Because different spices are used in different quantities, I calculated the percentage change in availability from the baseline year of 1966. A negative number means less of a spice was used in that year than in 1966. The chef has helped make Mexican food popular in the United States. His Frontera Foods empire was founded in Chicago, starting with the restaurant Topolobampo in 1986, so it’s not surprising that The Spice House’s local clientele would be heavily influenced by Bayless’s cooking. However, it probably isn’t representative of the rest of the country.